Apply direct from pail onto absorbing surfaces to correctly seal and bind the surface (more than less is highly recommended). Coverage is 50-60m2 per pail. When touch dry follow with the complete, as specified, Unitex system. Unitex® Cembond Substrate Sealer is a substrate conditioning treatment and is based on a pure acrylic polymer in a water emulsion specifically formulated for compatibility in the highly alkaline cement environment as a sealer or for cement modification. Unitex® Cembond Substrate Sealer is applied to porous masonry surfaces to even out and reduce the porosity (absorption) and create a seal for the later applied coats. This ensures improved adhesion between layers, improved durability of later coats, and evenness of the coating system. 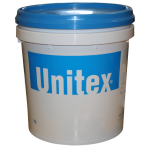 Unitex® Cembond Substrate Sealer is supplied in ready-to-use 15L pails. Approximate coverage per pail is 50-60m2 . Unitex® Cembond Substrate Sealer is for exterior and interior use and offers resistance to early hydrolysis and rain penetration into the substrate. Unitex® Cembond Substrate Sealer can absorb up to 5mm into very porous surfaces. Unitex® Cembond Substrate Sealer is compatible with all Unitex® acrylic renders and surface applied coatings.